Be the first to share your favorite memory, photo or story of Josefa. This memorial page is dedicated for family, friends and future generations to celebrate the life of their loved one. 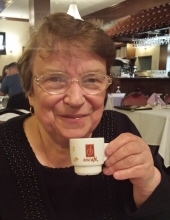 Josefa Cardoso, 84 passed away on Wednesday, March 20, 2019 at University Medical Center, Newark, NJ, with her loving family at her side She was born in Paco, Arcos de Valdevez, Portugal and came to the US in 1973 and resided in the Ironbound Section of Newark..
Josefa was a Factory Worker, before retiring many years ago. Beloved wife of the late Jose F. Cardoso; loving mother of Francisco Cardoso and his wife Ana, Jose M. Cardoso and his wife Paula, Paul Cardoso and his wife Carla; cherished grandmother of Michael, Casey, Avery, Rylea, Gabriela and Luis Cardoso; dear sister of Manuel Cunha and his wife Julia, Rosa Fernandes and her husband Manuel, and the late Jose Da Cunha and Antonio Da Cunha. The Funeral for Josefa will be on Monday, March 25, 2019 at 8:30 am at the Buyus Funeral Home at 426 Lafayette Street, Newark, NJ. Thence to Our Lady of Fatima Church, Newark, NJ where at 9:30 am the Funeral Mass will be offered. Interment Holy Cross Cemetery, North Arlington, NJ. Relatives and friends are welcome to attend. The visitation for Josefa will be on Sunday, March 24th from 1:00 – 3:00 pm. To send flowers or a remembrance gift to the family of Josefa Cardoso, please visit our Tribute Store. "Email Address" would like to share the life celebration of Josefa Cardoso. Click on the "link" to go to share a favorite memory or leave a condolence message for the family.